Children who grow up hearing Mandarin generally learn to speak Mandarin. Deaf children who grow up with parents and teachers who use sign language, generally learn to communicate in that sign language. It doesn’t take much imagination to see why children with AAC needs are likely to do best when they are able to see and hear competent communicators use AAC throughout the week. 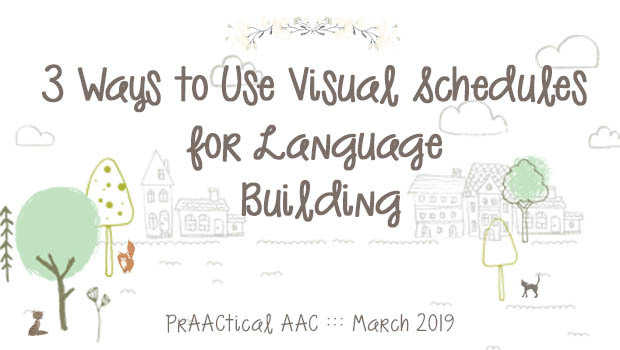 There is a growing body of evidence for the use of aided language input to support AAC learners at the beginning stages of language development and a great many more teachers, therapists, and families are employing these practices. That’s a very good thing. But is aided language input alone sufficient? Research studies have not yet addressed this question, but it is doubtful. Many AAC learners are not able to use observation and incidental opportunities to their advantage. For example, some are challenged with sensory issues that distract from the individual’s ability to attend to the surrounding conversations. Others are so busy working to keep their heads up, manage secretions, etc. that it is difficult for them to attend to the ways that their partners are communicating. So, how can we support beginning communicators beyond the use of indirect strategies, like aided language input? Here are a few ideas to get us started. Identify specific targets: “Any road will get you nowhere,” my grandma used to say. If you don’t have a clear idea of what specific language or interaction skill you are trying to teach, then it will be hard to plan clear instruction. Know the targets and be sure that others know them as well. Provide explicit instruction: Develop a plan to directly teach the target skill. More complex skills can be broken down into component parts and we can then teach those components bit by bit. For example, Gracie is building her conversational skills and is learning to take 3 turns in an exchange, each of which stay on the topic for that interaction. To teach this, we may want to teach some of the components (e.g., identifying the topic, making a relevant comment, waiting for partner responses) individually and chain them together to build conversational skills. Include evaluative feedback during intervention: Professionals are sometimes hesitant to give feedback to AAC learners that can be construed as negative and can be reluctant to let them know when they’ve missed the mark. That can be problematic, though, because if we don’t know that we’ve done something incorrectly or incompletely, it’s much harder to improve. Imagine learning the sport of archery, but when you shoot the arrow you can’t see where it goes and can’t hear if it hits the target. In this scenario, we don’t know whether to keep doing things the same way or change up our approach. Evaluative feedback is an important tool in many learning situations and one that we may want to use more frequently. Have you had good experiences with teaching strategies and approaches that go beyond aided language input? We’d love to hear about them. meaningful input, meaningful output, explicit instruction and fluency training. For an effective 2nd language curriculum they need to be evenly balanced. It seems to me that aided language input is mostly just covering the first and maybe the third points.